(2) Static pressure: This is the 'simple' reading of the outside air pressure. There's slightly more to it than you might think though, as opposed to the pitot, the static sensor nozzles must be carefully designed not to introduce a change in pressure due to the rapid forward motion of the aircraft. So, for example, the static pressure 'nozzle' is generally sideways facing flush with the side of the glider. But, now the design must also make sure no incremental pressure error creeps in when the pilot yaws the aircraft, because if the yaw points the static 'nozzle' more into the forward airstream pressure woud increase. So gliders generally have a pair of linked pressure nozzles either side of the fuselage to make sure the effects of yaw cancel out. Plus, gliders generally have two independent static sources, one from the front of the glider and one from the rear. 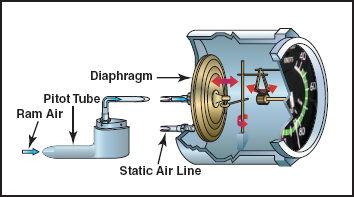 The most obvious use for the static pressure is to drive the ALTIMETER, which has a bellows similar to the ASI, mechanically driving the needles around the dial, but this time driven by static pressure acting on the outside of the sealed bellows on a fixed quantity of gas within them. (wikipedia). It is worth mentioning at this point that the ASI above also takes the static pressure feed, because the ASI reading is actually moving relative to the difference between pitot and static pressure. An easy misunderstanding to have would be to think that the pitot pressure alone would be useful to move the ASI needle, but the key point to understand is what pressure this action is moving against. Of course if the body of the ASI were also containing pitot pressure, the ASI needle wouldn't move at all - this isn't as crazy as it sounds because if the back of the ASI was open and you just relied upon the pressure in the cockpit, this is likely to be higher than external static because there's a 'pitot' effect of the air ramming into the openings at the front of the glider, in particular the aerotow hook opening. Then when you open the clear-vision panel in the canopy while in the air, the cockpit pressure drops. All this would introduce unacceptable errors in the instrument readings, hence the need to feed clean 'static' to the instruments. Having said all that, the ALTIMETER is the least sensistive of all the instruments. (3) Total-Energy tube (compensated static pressure): all modern gliders (including the Aerosoft Discus) have a pressure pick-up nozzle on a forward-facing tube on the leading edge of the tail fin. This is a rather clever device with holes in the the pick-up tube designed so that the static pressure is adjusted by a negative factor due to the pitot pressure. This pressure feed is particularly suitable for the VARIOMETER rate-of-climb reading. (wikipedia). Note that the variometer will depend on both this total-energy feed and another static feed (it is displaying rapid but very small changes in air pressure and is necessarily a very sensitive instrument). This compensated pressure reading has the effect of the variometer displaying the climb rate having discounted the fact that the aircraft is accelerating or decelerating - it's a complicated topic but from a glider pilot standpoint the variometer becomes easier to use because climbs due purely to the pilot pulling back on the stick (i.e. the glider also decelerates) have less effect on the variometer needle although it otherwise behaves as expected. As mentioned above, the variometers are reading the compensated static pressure from the total energy probe mounted on the fin of the glider and are displaying very small changes in that pressure. If you start the MOTOR, the backwash from the propeller will impact the probe on the fin and overwhelm the tiny variations in pressure and risk damaging the sensitive variometers. The SEGEL/MOTOR switch is a pneumatic switch that can be used to temporarily switch the static source to the variometers from the compensated source in the fin to the uncompensated nozzles mounted either side of the nose of the glider. The good news is the variometers will now be unaffected by the turbulence from the propeller. The bad news is the valuable compensation provided by the tube in the tail fin is lost. The variometer now acts as a pure rate-of-climb indicator, which is actually the most useful while the engine is running, You will find if you pull the stick back, the variometer will beep-beep-beep at an increasing rate, and show sink as you push the stick forward. After the engine is stopped and put away, you should remember to move the switch back to the SEGEL (soaring) position, and the SDI C4 and the Winter varios will operate like effective compensated glider varios as before. Note that the act of moving the pneumatic SEGEL/MOTOR switch in either direction sends a pressure pulse to the variometers which saturates them positive or negative for a few seconds. Note that the free 1.6 upgrade allows a 'hotkey' or joystick button to be associated with the 'static select switch'. You just have to go into the FSX main settings menu and assign a key or button to the 'alternate static' event (it's the first one in the 'Equipment' category, if you select that drop-down).